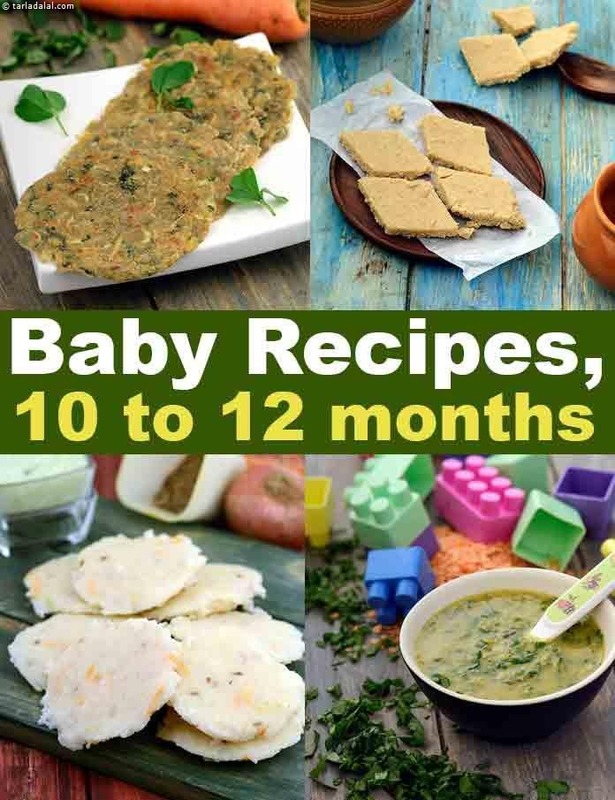 baby recipes for 10 to 12 month babies. Time will fly by and before you even realize it, you will be getting set to celebrate your baby's first birthday. By now, in addition to breast milk, 4 to 5 supplementary feeds per day are necessary for your growing baby. There are no hard and fast rules about when your baby should progress from one stage to the next. However usually most babies adjust to semi-solid and solid supplements with real gusto, by the tenth month. They may have already graduated to eating porridge, mashed fruits and vegetables, unstrained soups, khichdi and will be ready to try something adventurous. Grab this opportunity! This is the right time to add more combinations and textures of food to your baby's diet. Moreover, as they approach their first birthday, they begin to show interest in eating all those foods that other family members around them are eating and they are willing to experiment with them. This is the best time to gradually accustom your baby to eat with the family and also to eat the same meals as the family does. Try and enjoy at least one family meal everyday with your baby. These meal times are also a good way for her to learn to feed herself and also encourages her to be independent. She will learn to eat quicker and be more motivated to be self-sufficient by watching others at the table. Give her a clean baby spoon to eat on her own and serve food cut into tiny ‘bite-sized’ pieces so she can handle it easily. You can fill the spoon for your baby, but leave the actual feeding to her. Even if it is slightly messy in the beginning, she will soon learn her table manners. Like most adults, babies also eat with their eyes first, so their meals should look appealing. Make her meals more appealing by making foods into different shapes and sizes so that the food looks fascinating, adding different coloured fruits and veggies to make it appealing. You can also serve the food in colourful plates and bowls thus making meal times into happy times for you and your little one. Dairy Products: Continue adding fresh curds and paneer to your baby's diet at 10 months. Serve curds with parathas. Paneer can be added to roti and rice delicacies like Bulgur Wheat and Paneer Pulao. Fruit and Vegetable Juices and Soups: You can continue to serve one unstrained vegetable soup and/ or fruit juice as appetizers before meals or in the evenings. Fruit juices are great sources of a natural sugar called fructose that provides instant energy to keep your baby perked up. This will also take care of your baby's hunger until meal times. Most paediatricians are against giving juices and soups during meal times, as they can affect your baby's appetite and she may not be so willing to eat her meal after that. Again, do remember that there are no hard and fast rules and if your baby is happier with a 'soupy' dinner, just go ahead with it. This is a period of transition and exploration for your baby; especially where her diet is concerned. She is most likely to be ready for a switch from mashed and semi-puréed foods to finely-chopped and lumpy foods. However, some babies are reluctant to accept this transition and may just be really happy gulping mashed foods. Include a variety of chopped vegetables like carrot, potatoes, spinach etc. to your baby's meal. Your little one is going to be extremely attracted to colourful and 'feel-good' dishes so do pay attention to the colour and texture of her meals. Colourful dishes like Jowar and Bajra Vegetable Roti and Cabbage Moong Dal Khichdi and Spring Vegetable Risotto will be accepted easily by your baby at this stage. As your baby grows older and continues teething, encourage her to have whole fruits and vegetables like banana, chickoo, apples and cucumber, which are soothing for the gums. Chewing food is also great exercise for your baby’s gums when she is teething and helps to strengthen the new teeth that are emerging. Peel and cut the foods into bite-sized pieces. Fruits and vegetables provide bulk in the diet and aid in the baby's bowel movements too. But always keep a watch, to avoid choking. The good news for you is that you may no longer need to prepare special meals for your baby. By the end of the first year, your baby can start eating everything from your family pot. Just keep her portion aside before adding spices and seasoning to the food for the other family members. In fact, a wonderful way to acquaint your baby with your 'ghar ka khana' is to mix a spoon or two of your regular food to the portions you have kept aside for her. This will gradually help your little one to adjust her palate to these new and wonderful tastes of your home cooking. At this age, you can also introduce fermented foods to your baby's diet, as these are nourishing and easy for your baby to digest. Curd is an example of fermented food that is commonly eaten on a daily basis. However, curd is introduced to your baby at eight months itself because it is easier to digest. Idlis, dosas, dhoklas, etc. made with a combination of cereals and pulses are also good examples of fermented foods, which can be added to your baby's diet from the tenth month onwards. Vegetable Idlis is a fermented dish which your baby will definitely relish! Some foods like whole nuts, raw peas, corn, etc. should be avoided till your baby is a year old as they can cause choking. For that reason, they’re not safe for your baby to eat at this stage in their whole form. However, as they are nutritious, you can mash or purée them before giving them to your baby. Corn Sambhar is an example of such a food. You can start adding restricted amount of salt to your baby's diet at this stage as they are getting used to regular home-cooked food. However, some paediatricians recommend avoiding it till your baby turns one. So it is advisable to consult your paediatrician before adding salt to your baby's meals. Enjoy our collection of Baby Recipes for 10 to 12 months other baby recipes articles below. I didn't want to use refined cornflour to make custard, so i experimented with this really easy way to make an instant custard. It's ready in a jiffy and full of goodness too. Serve it with your baby's favourite fruits. This is a quick and simple recipe for a baby who is being introduced new food. Sooji is light and easy to digest. Remember, consistency of the kheer needs to be thick and smooth so that a baby can swallow it easily. This soup is an excellent soup for babies who have started on solids (8 months onwards). U can roast the oats, wheat germ and brown rice powder and store in fridge.u can add peaches or any other fruit your baby is fond off.